The Pacific Crest Trail (PCT) is a 2,650 mile long hiking and equestrian trial that extends from the Mexican border to the Canadian border. It was designated a National Scenic Trail in 1968 and is closely aligned with the highest parts of the Sierra Nevada and Cascade mountain ranges in California, Oregon and Washington. It ranges in elevation from a little above sea level at the Oregon-Washington border to above 13,000 feet in the Sierra Nevada. The PCT primarily travels through National Forests and protected Wilderness Areas. Altogether it passes through 25 National Forests and seven National Parks and generally avoids civilization. 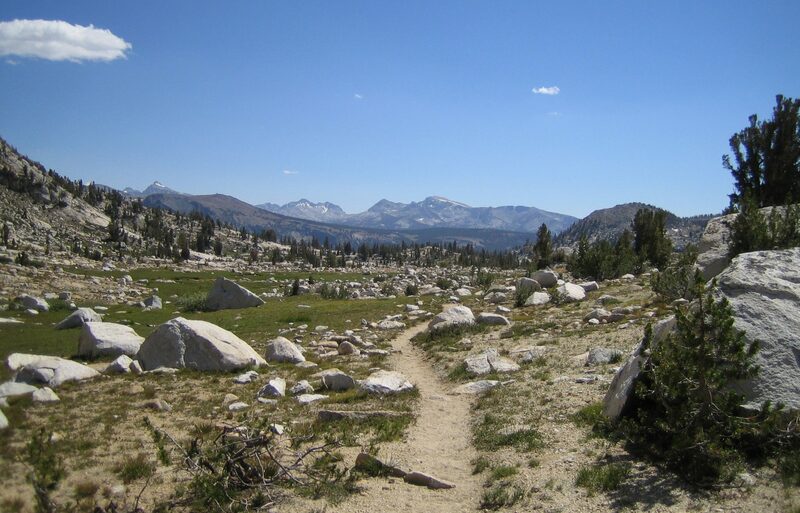 The PCT is considered one of the three classic long-distance hiking trails in the United States. The two other trails being the Appalachian Trial (AT) and the Continental Divide Trial (CDT). Hikers that successfully complete all three trails are said to have completed the “Triple Crown of Hiking”. “Thru hiking” is a term that refers to hikers that complete the entire long-distance trail from end to end in a single trip. For most PCT hikers it takes between four and six months to hike from border to border. There are a few elite hikers that have completed the PCT in less than two months which means they averaged over forty miles per day! Hikers that complete a long distance trail (PCT, AT or CDT) over multiple trips and/or multiple years, are referred to as “section hikers”. Most PCT hikers start from the Mexican border and hike to the Canadian border and are referred to as Nobo hikers (north bound). A few hikers are Sobo hikers. A very few hikers are “Yoyo” hikers and hike the entire trail from south to north and then turn around and hike back to where they started, all in one hiking season. The challenge for most Nobo thru hikers is to time their start at the southern border so that they avoid the extreme high temperatures in the Southern California deserts and also avoid the deep snows from the previous winter in the Sierra Nevada and then complete their hike in Washington before the following year’s winter snows arrive. In most years there is a five to six month window from approximately mid-March until mid-October. Most Nobo hikers start their hike at the Mexican border between mid March and mid-May. The Pacific Crest Trail Association (PCTA) is responsible for issuing long distance permits (over 500 miles) to interested hikers every year. They issue 50 permits per day on a first-come first serve basis.